Fleet Feet: Can you give us a little background on how you became a physical therapist? Sarah: I became a physical therapist, because I fell in love with the profession while going through physical therapy myself for multiple high school basketball injuries. Physical therapy was the key to my successful rehabilitation, so I wanted to give the same in helping people recover from their sports-related injuries. I also place a strong emphasis on prevention of further injury, so that individuals may stay active and achieve goals above and beyond their current level of fitness. Toni: The art of physical therapy caught my attention when I was burned out from the corporate world and looking to make a career change. After observing a couple of my friends who are physical therapists and discussing the profession with them, I knew it was a perfect fit for me. Having an opportunity to build a relationship with individuals from all walks of life, while at the same time truly making a difference in their lives is why I love being a physical therapist. FF: What are the most common running related injuries you see in your clinic? The most common running injuries we see at OnCore include IT Band tendinitis, shin splints, patellofemoral pain (Runner's knee), ankle pain associated with Achilles/Posterior Tibial Tendonitis, low back pain, and shoulder pain related to poor bio-mechanics with arm swing during running. With the combination of manual therapy (soft tissue mobilization, joint mobilization/manipulation), neuromuscular reactivation/reeducation (core and postural awareness, kinesiotaping), and therapeutic exercise (stretching and strengthening), we treat the above problems and more to get you back to running without pain. FF: Is Physical Therapy beneficial for running-related injuries? Physical therapy is VERY beneficial to runners. Runners often have weak core and hip musculature (especially the gluteal muscles), which stabilize the hips through the single-leg stance phase of running. These muscles require endurance training to prevent fatigue (we have all seen hips dropping at the end of marathons). It is critical to have core and hip stabilization/strength in order to reduce stress on the spine, hip, knee, and foot/ankle. Your physical therapist will perform an evaluation to identify muscle imbalances, strength, and flexibility deficits in order to design an individualized exercise program to normalize these deficits. FF: How important is proper footwear for your patients that exercise? Proper footwear is extremely important - whether you are exercising or not. Proper alignment of the body starts from the ground up, so supporting the feet in a neutral alignment then allows for correction of the ankle, knee, hip, spine, and so on. The "right" shoe and insert support is different for everyone. As physical therapists, we recommend going to a running shoe store (our choice is Fleet Feet!) that assesses foot type with gait analysis. The staff at Fleet Feet has helped many of our patients with selecting the optimal shoe and insert for pain-free standing, walking, and running. FF: Do you incorporate Pilates into your physical therapy practice? Pilates and physical therapy (P.T.) are a perfect match for each other as they share many of the same concepts-- core strength, body awareness, and a focus on breathing and alignment, just to name a few. Patients are seen 1-on-1 for their entire P.T. session allowing for incorporation of Pilates exercises into their regimen even if they don't have prior Pilate’s experience. Typically, a physical therapy session at OnCore begins with more "traditional" interventions and as the fundamentals are mastered, exercises are advanced on the Pilates equipment. For those individuals without injury and simply interested in Pilates as a fitness regimen, we also offer group and private Pilates sessions. FF: What is a success story you can share about an injured runner who came to you? Sarah: I once had a runner come to our clinic while training for a half marathon. She was complaining of foot pain near her arch. Turns out she had a bone called the navicular bone out of place. After a joint mobilization and a "pop", she was pain-free instantly. Then, we strengthened the muscles around the bone (the deep intrinsic muscles of the foot) for the next 4-6 weeks to solve the problem of why the bone was injured in the first place. She was able to run her half marathon two months later without any pain, and she even set a new personal record! It is not always about treating the patient's symptoms, but treating the root cause of the symptoms. Toni: Ah, but which one do I choose? I had a patient who was an avid runner and cyclist experiencing shin splints, knee pain, and occasional low back pain on the same side. He was what one may call a weekend warrior. He had a desk job that required sitting all day, but on the weekends he "made up for it" by exercising to the max. After correcting his postural alignment from the ground up in sitting, standing, and running, as well as improving his core strength and flexibility, he was back to being a weekend warrior, only smarter-- he did Pilates during the week to maintain his fitness and prevent further injuries. FF: If someone wanted to come and check out your clinic, how could they contact you? We'd love to meet you! Our Dunwoody location offers both physical therapy and Pilates and is located at 4505 Ashford Dunwoody Road, Atlanta, GA 30346-- in the same shopping center as Cafe Intermezzo. Please stop by anytime at this location for a tour of our studio! Our Roswell office located in the Atlanta Arthritis Center at 1305 Hembree Road, Suite 101, Roswell, GA 30076 is physical therapy only. 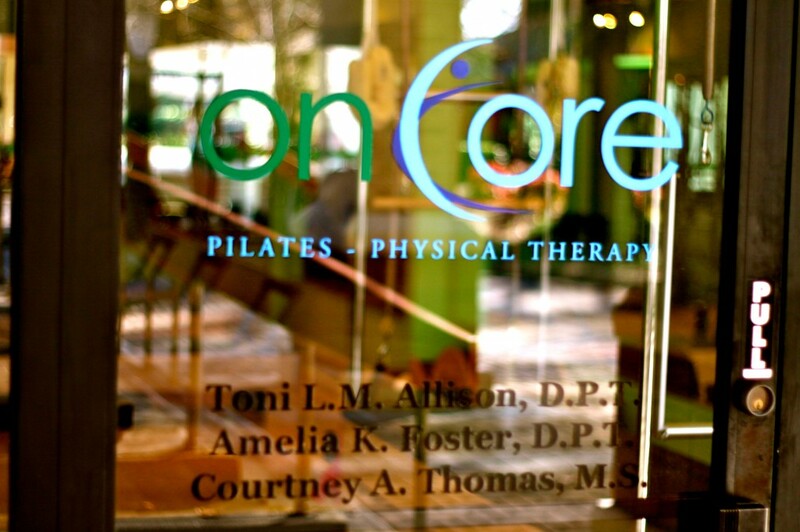 Our phone number is 770-393-0111 and email is info@oncorept.com. We look forward to hearing from you! Please also check out our website at www.oncorept.com.